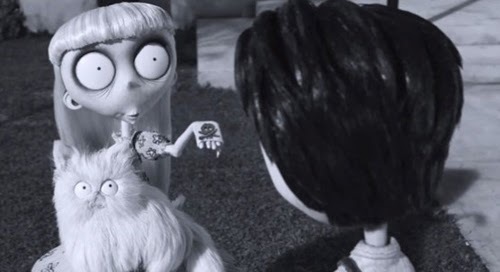 Tim Burton may have gone full circle, from making fare forcibly skewed towards Disney’s more sugary sensibilities (even if the 1984 Frankenweenie short came about during their “dark period”) to actually seeing the world that way. I don’t count myself among the many who believe Burton has completely lost his way, but I do wish there was more of the unfettered abandon found in his first couple of films. His movies have always been stylistically and narratively erratic, and there are few unqualified successes in his filmography (Pee Wee’s Big Adventure, Beetlejuice, Ed Wood). Yet, most of the time, his offerings are at least diverting. The problem lies in his “brand” whackiness; it can easily lead to fatigue setting in (Alice in Wonderland, Charlie and the Chocolate Factory). That feeling of overkill of the same schtick; “Stop it now, Tim. Please”. Nevertheless, I would even defend several of his movies that are considered indefensible (Planet of the Apes, Dark Shadows). Frankweenie, from its title down, is a cute riff on Universal’s 1930s adaptations of Mary Shelly. As such, the only disappointing thing about it is that it is a riff that never surprises. 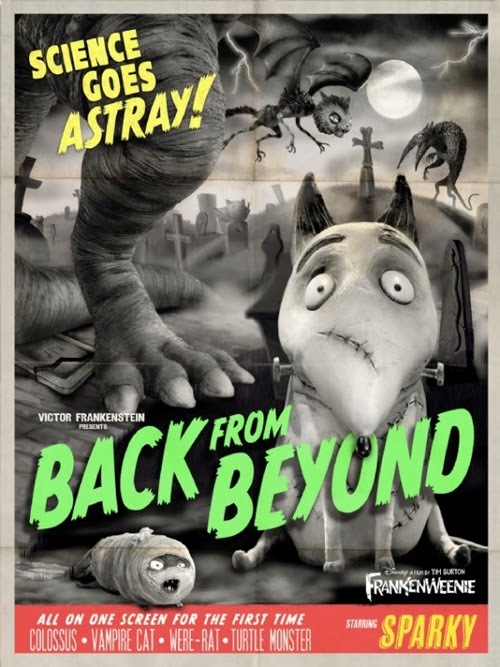 This is exactly what you’d expect of a Burton movie about a Frankenstein mutt. 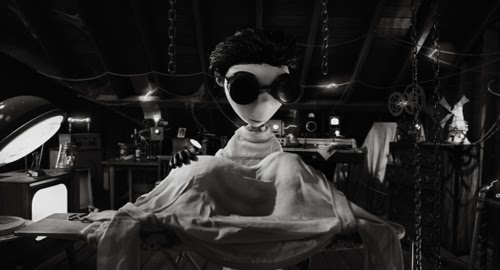 It’s the director’s second animated feature, following on from the so-so Corpse Bride (many assume he helmed The Nightmare Before Christmas, but that was Henry Selick who was also responsible for the first rate Coraline). Visually, this is highly accomplished, as you’d expect if you surrounded yourself with a gang of animation pros. 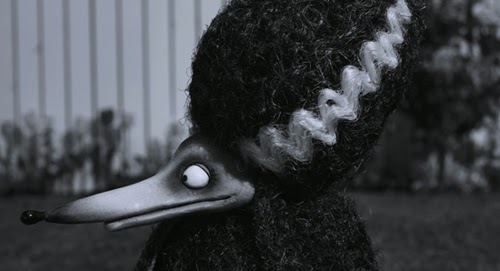 But the slickness of the stop-motion (so seamless, I thought it must be CG) is only matched by the manufactured quirkiness and unthreatening gothic veneer. 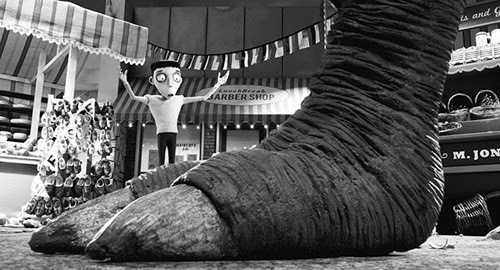 While I’m sure they saw potential dollar signs when Burton announced his intention to make a full-length feature from Frankenweenie, I doubt that Disney was overly keen when opted to shoot it in black and white. Sure, it can be a draw under the right circumstances (The Artist) but are kids really going to want to watch something devoid of colour? It seems not; the movie is his least successful, but for his other black and white picture (Ed Wood). Credit to him for going that route (as the director of one of the studio’s biggest hits, Alice in Wonderland, it’s little surprise Disney indulged him) but it only adds to the sense hat this is inconsequential whimsy; a side project he turned to when he wasn’t working with Johnny. John August’s screenplay is his fifth for Burton (although Dark Shadows was rewritten, much to August’s chagrin) and it repeats the set up and gags of the short fairly closely. There’s the road accident where Victor’s (Charlie Tahan) dog Sparky meets his doom, the bolt in his neck, his tail falls off and he springs leaks, the pet graveyard (“Goodbye Kitty”), next-door poodle Persephone complete with Bride of Frankenstein hairdo, and the overt lift of the end of Frankenstein as the dog is chased to an old mill. 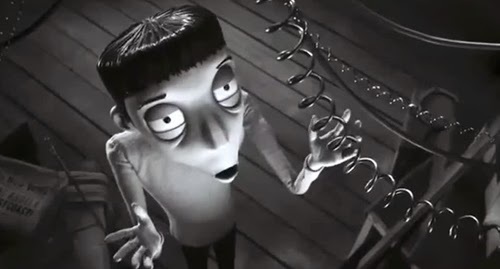 Burton’s short is lovingly adorned with an array of cartoonish actors, from Paul Bartel as the next door neighbour to Daniel Stern and Shelley Duvall as Victor’s parents. The all-out parody of the feature version is adorned with more overt grotesques. If Victor’s parents are fairly normal (voiced by Martin Short and Catherine O’Hara) his fellow school kids are a collection of weirdos and crazies. His teacher, Mr Ryzkruski (Martin Landau) is modelled on Vincent Price. 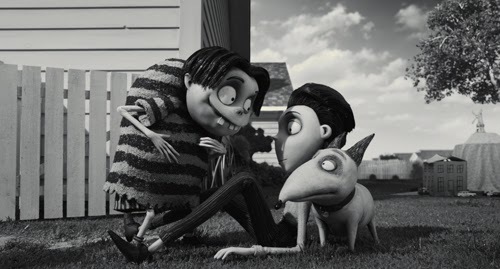 Edgar E Gore (Atticus Shaffer) is a delightfully horrid little hunchback, a little too eager to experiment with dead creatures (first fish, and then a decomposing rat); “Your dog is alive!” Nassor (Short again) is a Boris Karloff lookalike. Winona Ryder returns to Burton land after a more than 20-year gap as Elsa van Helsing. Best of all is “Weird Girl” (O’Hara again), an original character who exceeds any of the other new inventions. 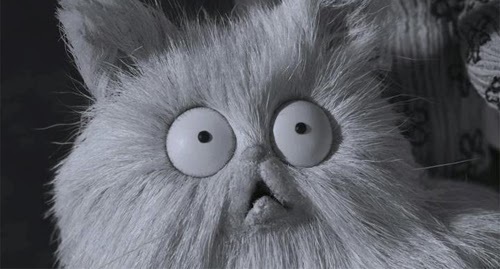 Her cat Mr Whiskers has premonitionary dreams and she offers gifts of cat faeces (“Did you get that out of the litter box?”) Both she and her cat possess eyes like saucers, and Mr Whiskers looks permanently startled/less than keen on his owner’s weird tendencies. Indeed, it’s in setting the scene that Burton’s movie is at its best. The third act monster rampage is awfully familiar and isn’t especially witty or clever (there’s a monster rat, a bat cat (Mr Whiskers), a mummy hamster, a kaiju turtle and some sea monkey monsters); such homages have been done much better many times before. 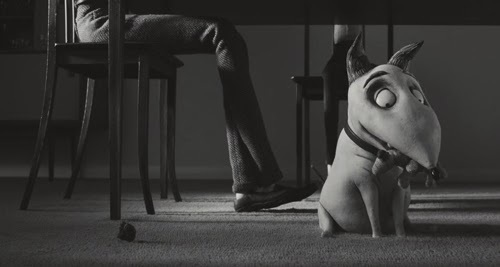 The design of Sparky is a shameless rip-off of Family Dog (on which Burton was Executive Producer and Design Consultant) and more effective in that regard than the short’s English bull terrier. But Burton seems to get cold feet over the grizzlier aspects of his premise; Sparky clearly starts out as a rotting pet, surrounded by flies and with bits dropping off him. I expected the decay element to develop, but Sparky becomes disappointingly sanitised and sanitary. Burton also feels the need to tack on an overt moral absent from his short. Sure, the 1984 film features a “Don’t judge by appearances” subtext (rendered redundant here by the freak show townsfolk) but there’s also an absence of judgement on the rights and wrongs of returning a canine from the grave. The director has never been especially interested in moralising, but he occasionally falls victim to the curse of many an otherwise decent filmmaker; sentiment wins out. Emotional range has never been his strongest suit and he wisely avoids such material most of the time (Big Fish might be his only film where the emotional content is justified and has some depth to it). Here, the “against nature, dangers of science-unleashed” theme is embarrassingly dispensed with, but not in a glib rambunctious manner (as might have been seen from the director of Beetlejuice, rather than the guy who called the shots on Charlie and the Chocolate Factory). The film has added multiple manifestations of lightning-struck pets in order to flesh out a third act absent from the half hour incarnation. So the message becomes, “It’s okay to reanimate corpses just as long as you really love them” (an endorsement for necrophiliacs everywhere, then). You can tell Burton doesn’t really “feel” his message; it’s necessary baggage for a family movie (“Reanimating a corpse. It’s very… upsetting” is more illustrative of his natural disregard for such attitudes). Apparently Burton is developing Beetlejuice 2; is it too much to hope he can summon the anarchic revelry of the original? 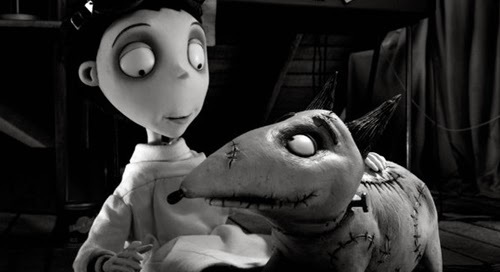 Frankenweenie is a wholly respectful expansion of the short. Which is part of the problem. 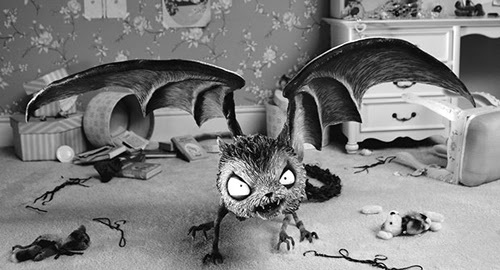 It’s the sort of thing Burton could knock-off in his sleep. Perhaps next year’s Big Eyes will prove a shot in the arm, and he’ll start trying again. At very least, it has the pedigree of the writers of his best film (Ed Wood; Scott Alexander and Larry Karaszewski).